After Weeks Of Wrangling, An Israeli Government Takes Shape : The Two-Way Prime Minister Benjamin Netanyahu has finally put together a coalition that appears focused on domestic issues rather than security questions or negotiations with the Palestinians. 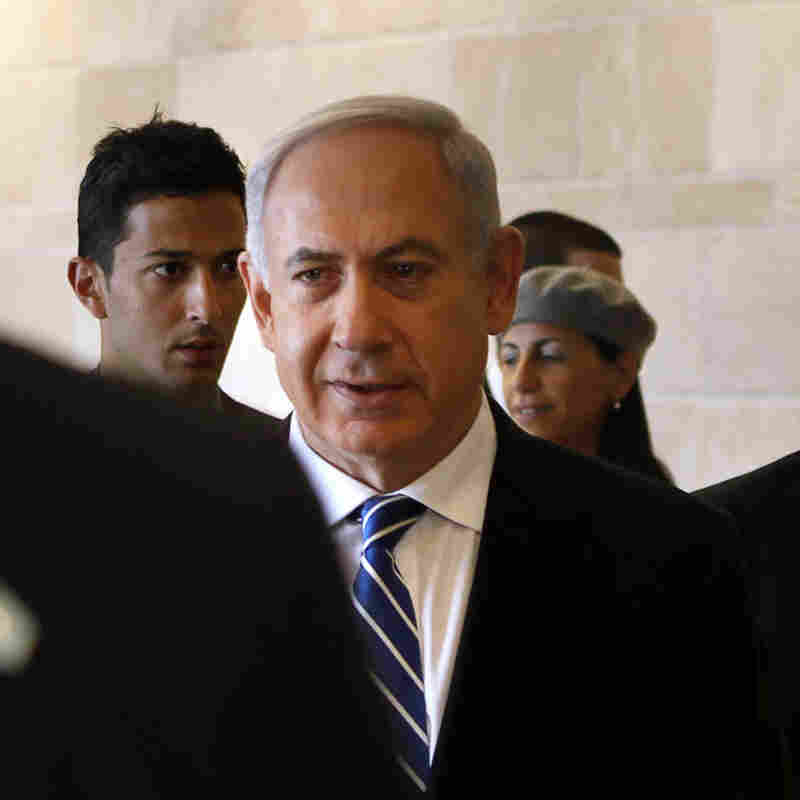 Israeli Prime Minister Benjamin Netanyahu arrives for a meeting in Israel's parliament, the Knesset, on Thursday. Netanyahu has reached agreement with other factions to form a coalition government following an election in January. Israel appears to have a new government, nearly two months after parliamentary elections. Since the voting in January, Prime Minister Benjamin Netanyahu has been trying to put together the pieces of a puzzle that just would not fit. If he included traditional allies, such as the religious parties, he would close out a chance of forming a government with a popular political newcomer, Yair Lapid. A former TV newsman, Lapid is secular and centrist. His party was the second largest in the balloting and has demanded that ultra-Orthodox Jews perform military service, rather than receiving an exemption. Professor Reuven Hazan of Hebrew University says that in the end, Netanyahu had to make major concessions to Lapid's centrist movement. The prime minister also made room for the right-wing Jewish Home party, which is strongly supportive of West Bank settlers. Meanwhile, ultra-Orthodox parties are not included in the government coalition for the first time in more than three decades. "He has formed a government that is not focused on the main issue of Israeli politics, which is security," Hazan said of Netanyahu. The new government appears more concerned with domestic questions, such as mandatory military service and government reform. Attacking those problems is likely to make life harder for Netanyahu, as he will have to take things away from his traditional supporters. The new coalition may allow Netanyahu to continue his hard-line approach toward the Palestinians. Jewish Home is opposed to the two-state solution entirely. Yair Lapid supports negotiations, but has made clear he will not make major concessions. Hazan says that means "we might get back to negotiating, but these negotiations will lead nowhere and they won't last for very long." The new government is expected to be sworn in just in time for the arrival of President Obama next Wednesday.